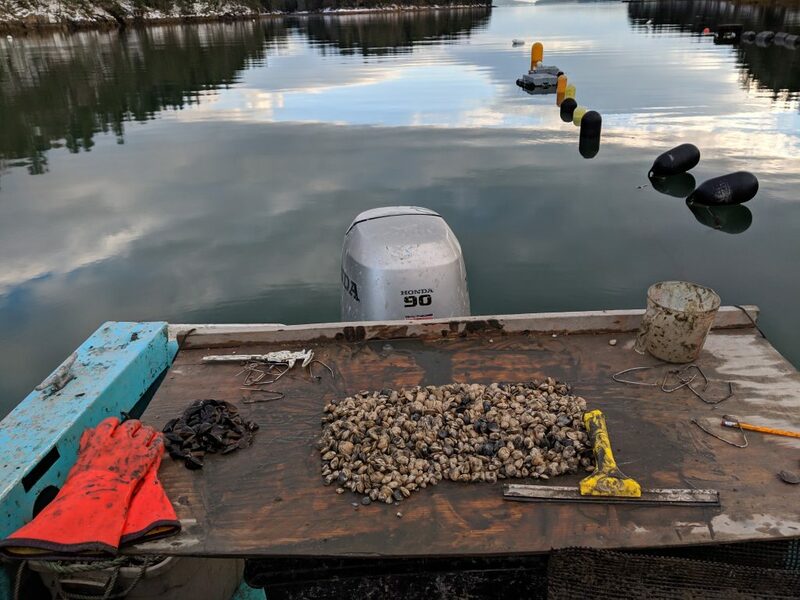 This project aimed to test the technical and economic viability of growing littleneck clams as a secondary/supplemental crop in a polyculture with oysters on a subtidal sea farm. 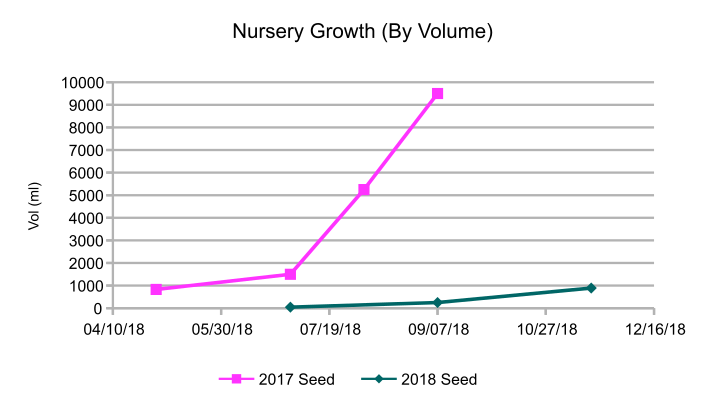 New nursery equipment improved seed retention to 87% (up from 41% in 2017) but nursery growth rates were greatly reduced- averaging 4mm for 2018 seed compared to 11mm in 2017. 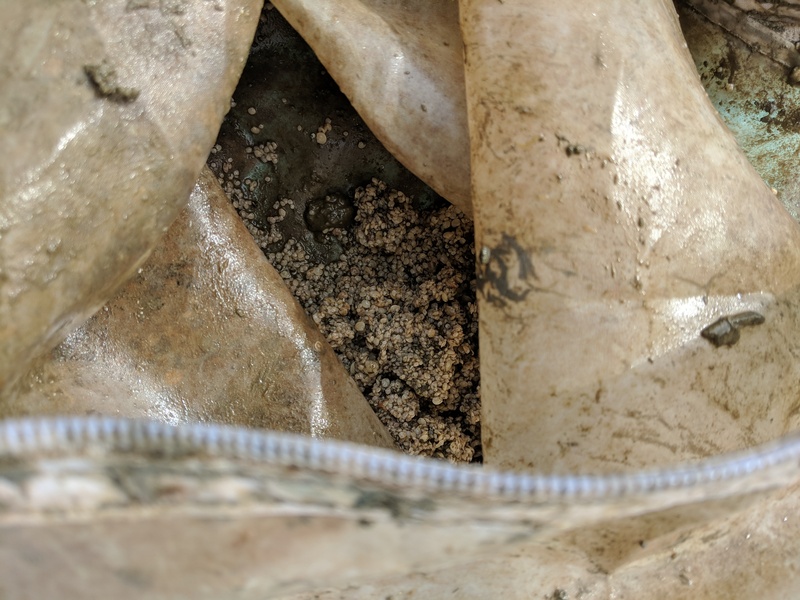 Growout of seed planted in 2017 continued in 2018 in rigid oyster bags- both at the surface and in sediments. Clams grown at the surface had an average length of 24.4mm after 16.5 months of growth. The largest clams in this treatment measured 33mm. Clams planted in the sediments averaged 20.1mm in length, with a maximum size of 34mm. 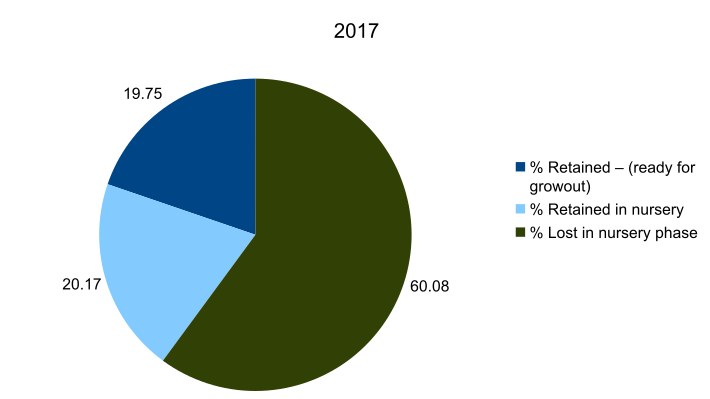 At these rates, clams are projected to begin reaching market size in the summer of 2019 (after two years of growth). Mortality was high in 2018 (26%), though unusually harsh conditions when overwintering likely contributed to this loss. Low costs of equipment and seed (as well as low labor demands) make this technique an economically viable production method- even with poor seed survivorship. Methods have already been shared directly with other farmers as well as a non-profit that focuses on farm and fisheries training. This project continued testing the viability of growing clams in contained-culture in the sediments below a floating oyster farm. This iteration focused on obtaining a realistic view of the economic viability of the technique and aimed to the reduce nursery-stage loss seen in the 2017 experiment. 7) Determine actual value of crop if market-size within the study period. Subtidal aquaculture offers the opportunity for farmers to expand their operations and diversify their crops by utilizing the vertical space of the water column. Most seafarms are monocultures that only use the portion of the water column that provides their specific crop optimal growth. Adding a species with different environmental needs would allow a farmer to expand in-place and reap the benefits of additional products and increased operational resilience to disease and pests (without needing to re-enter the arduous lease permitting process). Littleneck clams are an attractive secondary crop for oyster farmers. They are unique in that they are most valuable at a small size. Both species are sold in the per-piece half-shell (raw) market, which offers a considerably better price than the per-pound commodity market (where other northeastern clams and mussels are sold). Additionally, farm-grown shellfish often offers a premium over wild-harvested shellfish on the half-shell market. The contained, subtidal (always submerged) method of growing littleneck clams proposed by this project offers considerable environmental and cultural benefits over the traditional intertidal methods used on the east coast. In intertidal culture, clams are planted in netted plots or bags on exposed mudflats. This practice can be disruptive to wildlife (including sensitive shorebirds) directly excluding them from critical feeding areas or driving them away with increased activity. In many places these farming practices are prohibited or limited by law. The intertidal zone has traditionally been used as a commons for wild-harvest of clams and marine worms. There is strong resistance to removing any portion of the fishing commons for private use. Intertidal clam culture also finds conflict with shore-front property owners and those engaged in outdoor recreation for aesthetic reasons. Growing clams below an existing oyster farm would avoid these conflicts. Where subtidal culture of littleneck clams is practiced, seed clams are sown loose on the ocean floor and are harvested by dredging or dragging (at great detriment to other bottom dwelling species and long-term habitat structure). This method is not compatible with floating oyster culture, as dragging is impractical in the footprint of the ropes and anchors that make up a floating farm. The contained subtidal method proposed in this project does not rely on any bottom dragging or dredging. Clams are contained in rigid-plastic shellfish bags and are brought to the surface with ropes. The farm was raised from its submerged overwintering wintering position to its floating growing-season position between April 7th and 30th. Clam length, volume, mortality and pest presence were measured on 4/30, 6/1, 7/1, 8/4, 9/7, and 11/17. 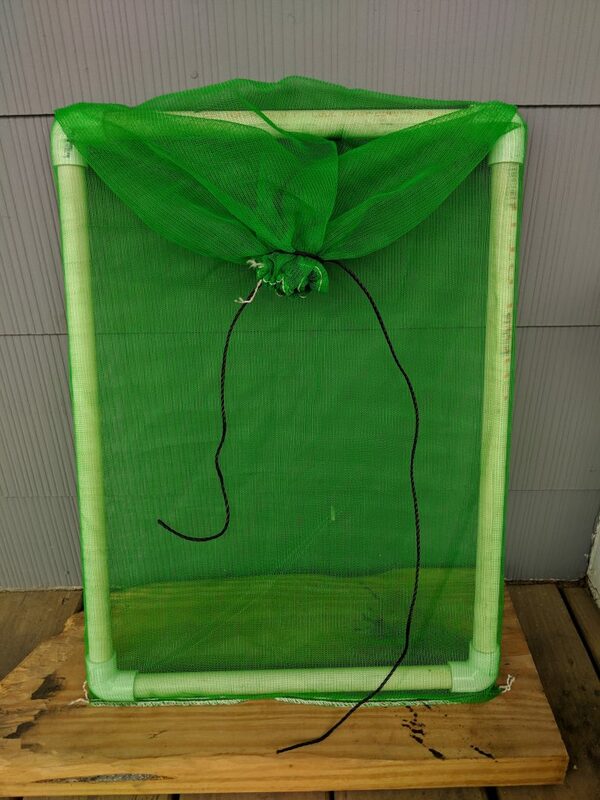 Fine mesh screens and nursery bags were acquired/constructed in May and June. New 1mm clam seed was planted on June 25th. The 2.5mm and 4mm seed originally ordered from the hatchery was not available. Small seed (ave. 4mm) that remained from the 2017 planting was used to test new nursery equipment in the early part of the season, before the 2018 seed arrived. Tests of the effects of stocking-density on clam growth began 9/7, when sufficient volume for multiple treatments was achieved. In April of 2018, clams planted in 2017 were moved from their wintering location (in the deepest and safest portion of the farm) to surface and sediment growout positions designated for the study. 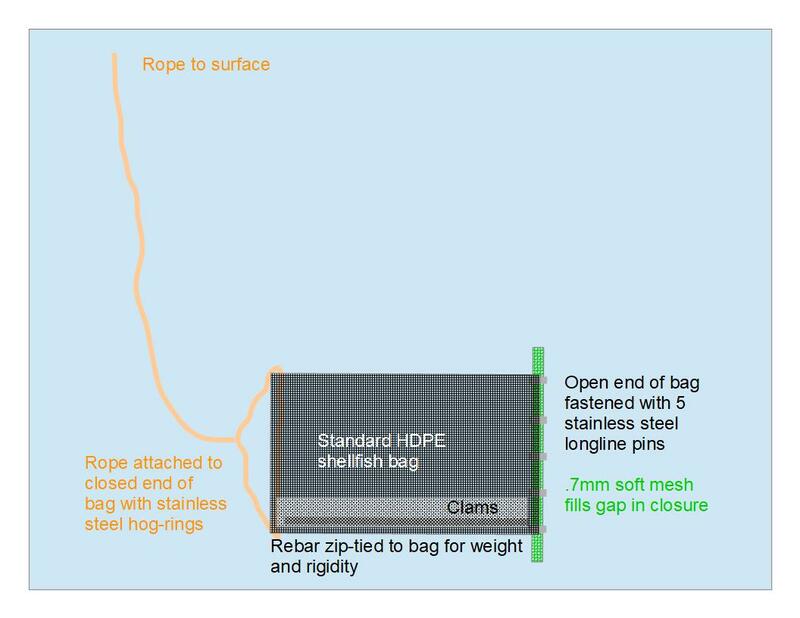 Clams were placed in clean rigid bags used in the prior study (4mm square mesh HDPE oyster bags sealed with longline pins and a fine-mesh closure gasket -see photos and diagram below). Clams were grown in these bags for the remainder of the growing season. Bags of surface-grown clams were deployed in floating oyster cages. Sediment treatment bags were lowered with ropes to the soft substrate below the farm in two different locations. Bottom planted bags were hauled to the surface weekly to check for fouling and to prevent them from sinking too deep into the sediments. Surface/nursery bags were rotated between sun and shade on a weekly schedule to avoid buildup of algae. Length, volume, fouling, predator presence, and mortality measurements were taken on a monthly schedule until the middle of November. The surface treatment bags were split in September, when a sufficient volume was present to perform a test on the effect of stocking density on growth rates. Stocking densities of 3000ml/bag and 6000ml/bag were tested in both surface and sediment conditions in the same equipment used in the rest of the growout study. This experiment was limited by the amount of clams available and thus only ran from September through mid November. 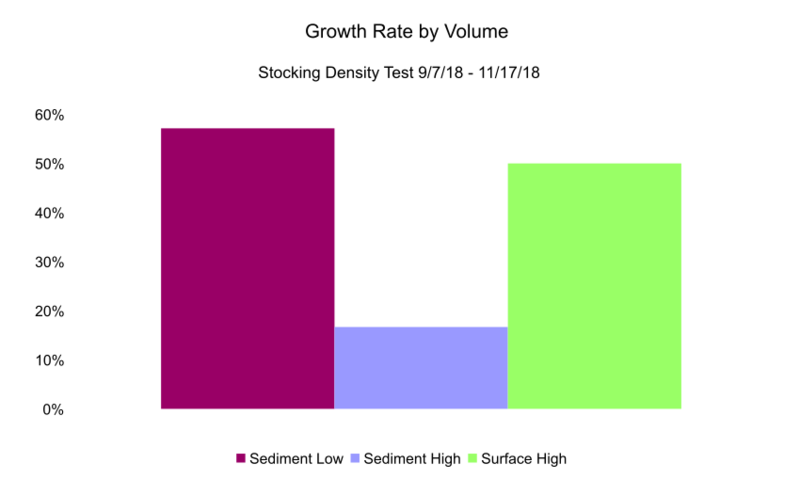 Growth and volume data from earlier in the season was also analyzed to investigate the relationship between stocking density and growth-rates. The 2.5 and 4mm seed originally ordered for this project was not available due to hatchery issues. Instead, 1mm clam seed was acquired in late June and deployed in 5 gallon 0.22mm mesh bags placed in floating oyster equipment. These bags are marketed for producing nut-milk or herbal-extractions. 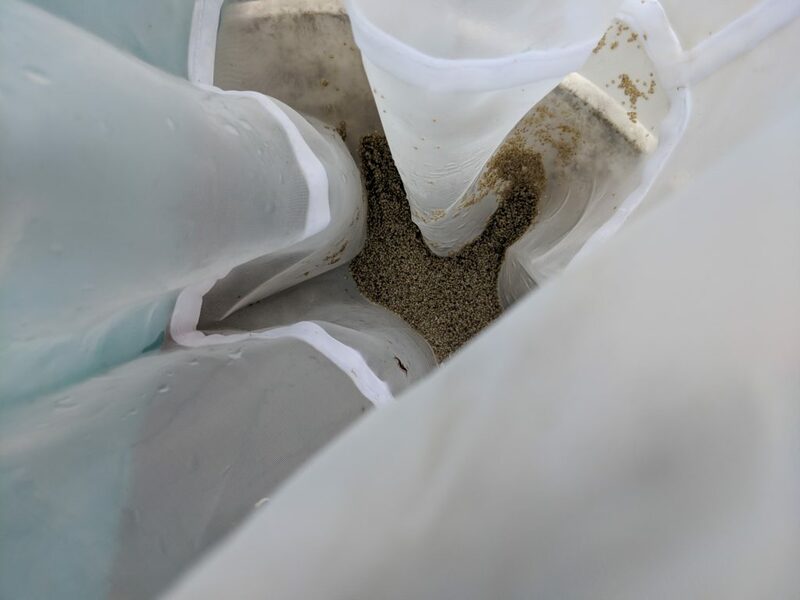 Clam seed that remained in the nursery from 2017 (4mm average) was deployed in .75mm soft mesh spat bags that were stretched over PVC frames (see photo below). 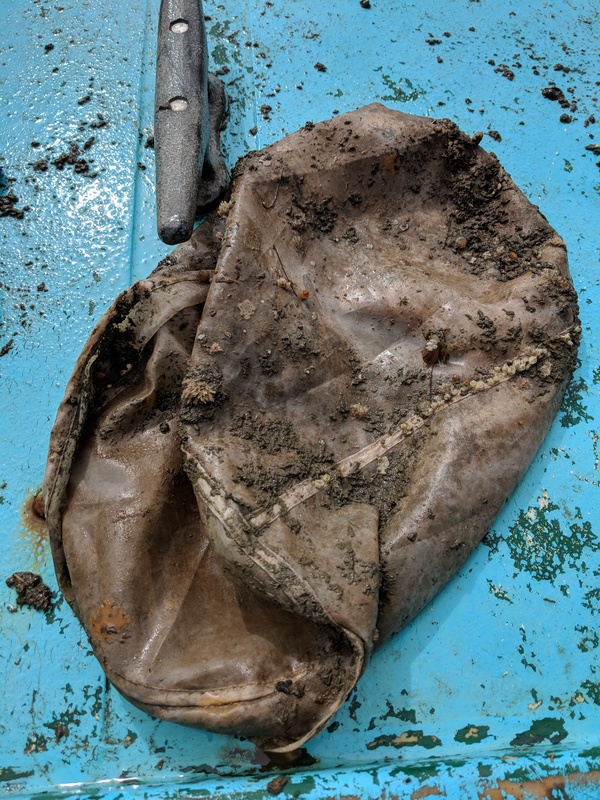 These bags were placed in floating oyster equipment. 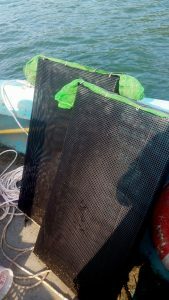 All nursery bags were rotated between sun and shade weekly to prevent algal fouling. Each month, mesh was cleaned with an on-board saltwater pump or was swapped out with fresh equipment to prevent invertebrate fouling. Clams were removed from bags and handled as little as possible to prevent loss. In August, the 2018 seed was moved from the 0.22mm mesh to the 0.75mm mesh and the 2017 seed “graduated” to the growout equipment (4mm mesh). Seed clams (1mm) planted in July 2018 grew at a much slower rate than 1mm seed clams grew over the course of the 2017 season. In 2018 seed clam shell lengths grew just over 4 times in length (ave. 4.1mm) compared to 11 times in 2017. 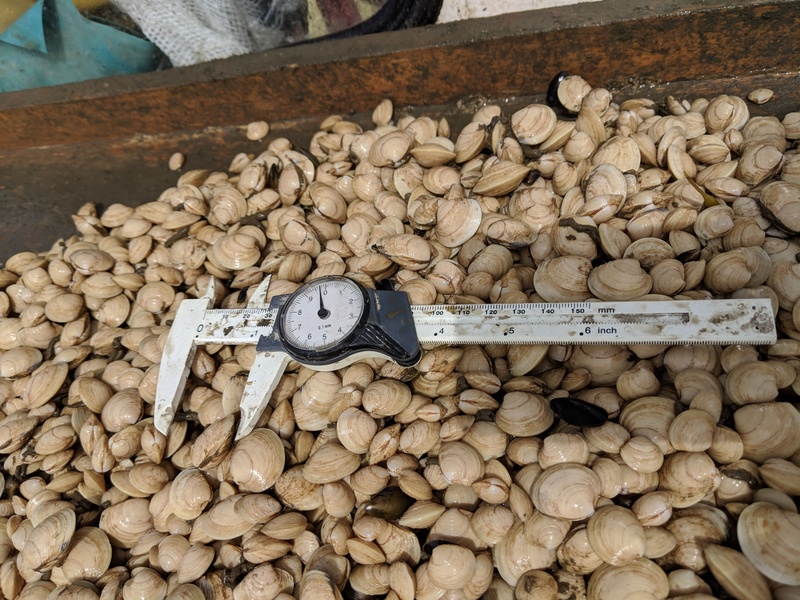 The 4mm (ave.) clams that remained in the nursery from 2017 grew just under 4 times in length over the 2018 season – with a final average shell length of 15.5mm. The dry-measure volume of nursery treatments increased from 45ml to 890ml in new 2018 seed (~20 fold increase). Treatment volumes of the 2017 seed that remained in the nursery increased from 830ml to 9500ml from April to early September (15 fold increase). This seed was then moved to the growout experiment where it grew to a final volume of 12500ml. Change in treatment volume over the 2017 and 2018 growing seasons. The loss in volume in the “Low Density Surface” treatment reflects mechanical loss from a failed bag closure. 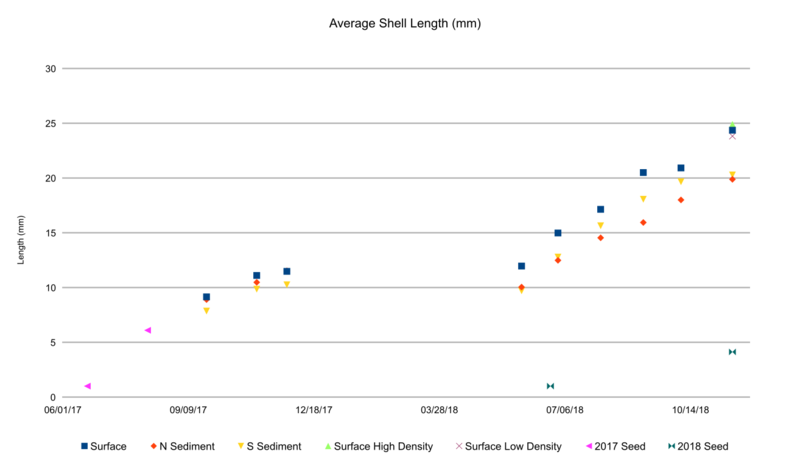 Clams in the surface treatment grew from an average length of 11.9mm to a length of 24.4mm in 2018 (2.1x growth). The maximum shell length observed in surface grown clams was 33mm. Clams growing in the sediments grew from 9.7mm to 20.3mm (2.1x growth) on the southern end of the farm and from 10.4mm to 19.7mm (1.9x growth) on the northern end of the farm. 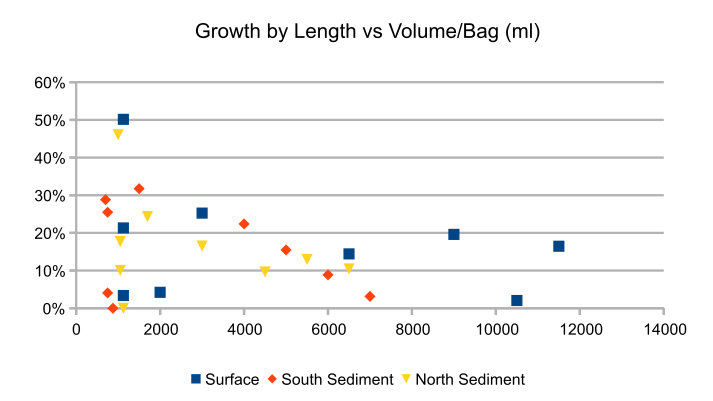 The average of sediment treatment growth was 2.0x growth in length. The maximum shell length in the sediment treatment was 34mm. The volume of surface treatment clams increased from 1125ml to 11500ml (10.2x growth), though a bag-closure malfunction in September caused a loss that depresses this figure. Clams grown in the sediments had volumes increase from 750ml to 7000ml (9.3x) in the southern deployment and from 1050ml to 6500ml (6.2x) in the northern deployment. 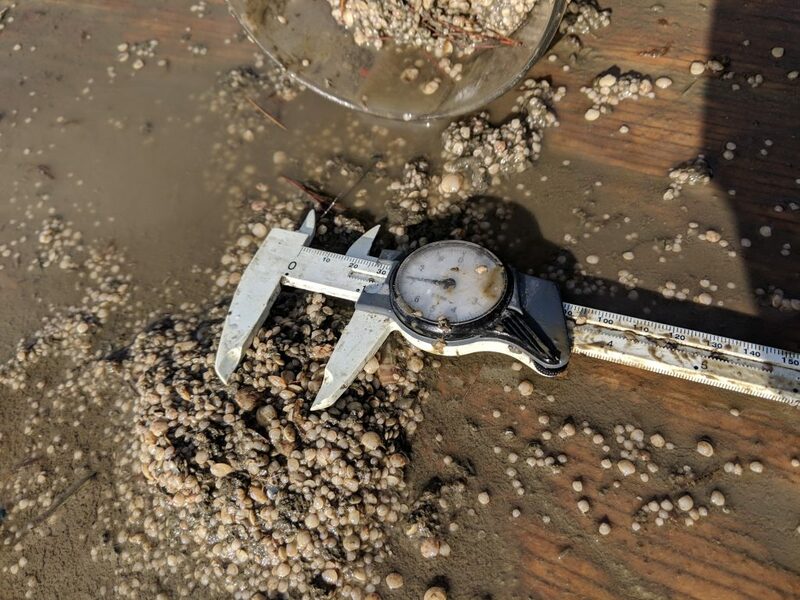 Clams at the surface grew at similar rates to the average of sediment-treatment clams for much of the 2018 season. 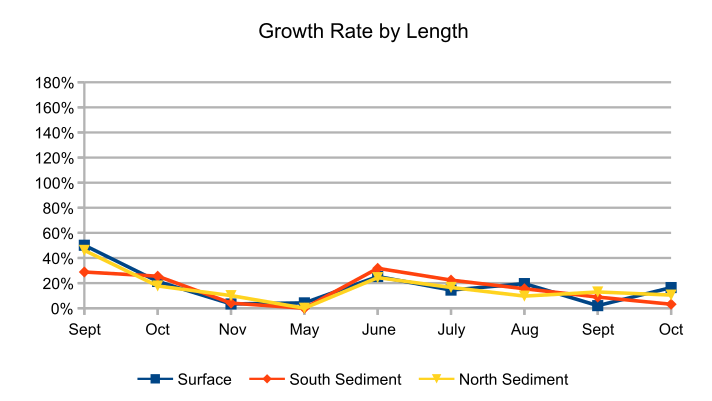 Clams growing at the surface in May grew at a much faster rate than those growing in the sediments (77.8% vs 11.9%). There was a high degree of variability between the two sediment treatments over the 2018 season. 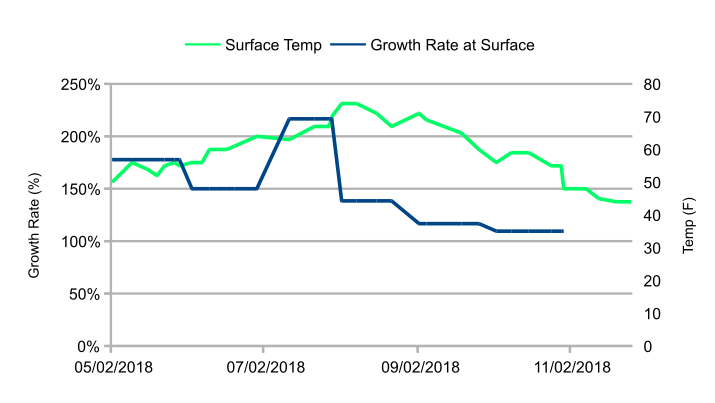 *Surface-treatment growth rates in Sept. and Oct. are for the high-density treatment only (to avoid conflating mechanical loss in the low-density treatment as slow growth) . These figures may underestimate growth rates at the surface during these months. Growth rates at the surface did not closely track with surface temperatures. Clam growth rates dipped during the period with warmest water (in Aug. and Sept.) when oysters on the farm were growing the fastest. In sediment-grown clams, the low-density treatment (starting volume 3000ml) grew at a much faster rate (57%) than the high density treatment (starting volume 6000ml. – growth rate 17%). A broken closure-pin caused a substantial loss of clams in the low-density surface treatment and forced the elimination of a comparison of surface treatment densities. The high-density surface treatment had a growth rate of 50%. 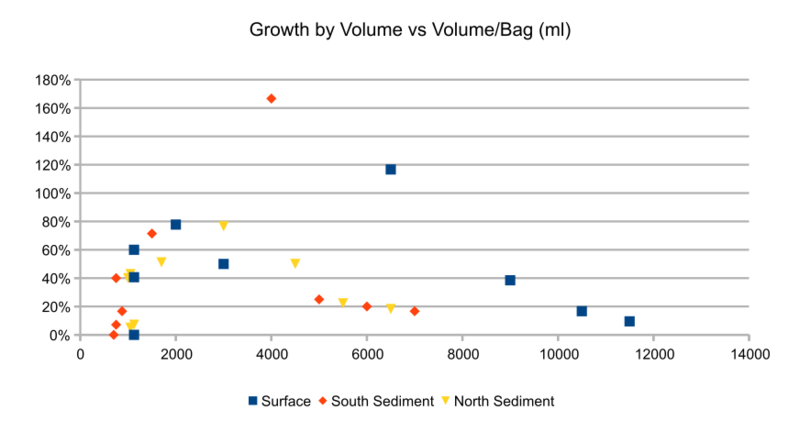 Monthly growth rates (defined by both Δlength and Δvolume) were graphed against the volume/bag for the course of the growout experiment. This data shows highly variable growth rates at volumes below 4000ml. 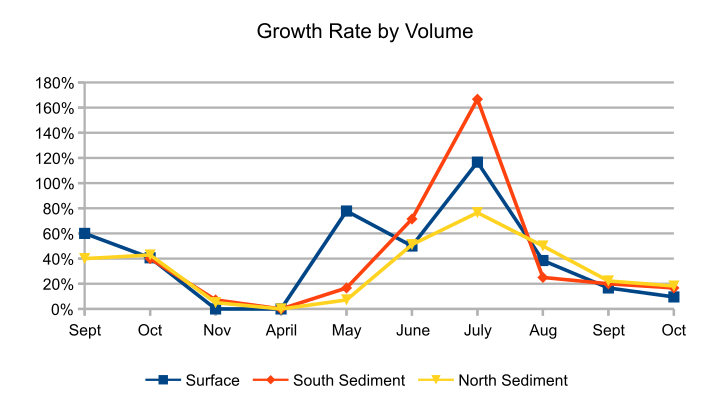 Growth rates appear to decrease in sediment-grown clams when volumes exceed 4000ml. Note that these higher volumes were only achieved in later months of the study, when growth rates began to slow across all treatments, and do not necessarily show causality. 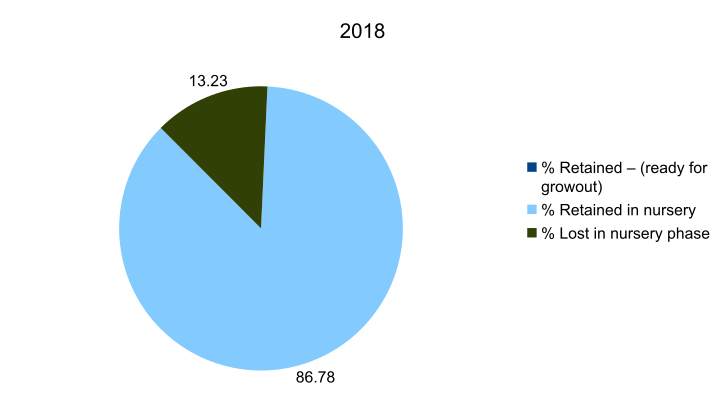 Seed retention was much higher in 2018 (87% retained) than in the 2017 planting (40% retained). Seed loss in 2018 can be attributed to handling (measurements and transfer between bags for de-fouling). Mechanical loss in the nursery was negligible. Though much more seed was retained in 2018, it was not large enough to move out of nursery gear into growout equipment. In 2017 nearly half of the seed retained reached a large enough size to be moved to growout equipment. The winter of 2017-2018 was especially harsh and caused much high than typical mortality in oysters across my farm. The bay fully iced-over in mid December and didn’t clear until mid February. Marker buoys were lifted and moved by ice-floes, overturning cages that contained both oysters and clams- smothering them in anoxic mud. Clam mortality figures below may be higher than typical. The above table shows apparent mortality- open and/or empty clam shells when first handled in 2018. It is likely that some dead clams were sealed shut with mud and were not counted in the above figures, but instead counted below in growing season losses as mud-filled clams gradually opened up. All treatments were overwintered using the same methodology (storage in oyster cages). Differences in winter loss can be attributed to different levels of burial in anoxic mud (with the north sediment treatment seeing the worst conditions). The majority of the above loss can be attributed to small clams early in the season (likely winter kill). Mortality in a smaller scale was noted in larger clams with broken shells in the last two months of the study. Larger clams seemed especially vulnerable to over-handling. Mechanical loss was also seen in surface grown clams (due to the broken pin-closure mentioned earlier in the report). Overall losses are listed below. The first table omits the initial mechanical losses in the 2017 nursery. Overall, 2018 was a bad year for fouling across the farm- A very large “set” of blue mussels in late July fouled all floating equipment on the farm, but particularly effected smaller mesh and equipment that could not be air-dried (such as .75mm mesh clam nursery bags). The smallest mesh (0.22mm) prevented mussel larvae from entering bags, but were still somewhat fouled on the outside. In this scenario, clams could be swapped to clean bags without issue. Smaller sets of sea squirts fouled equipment later in the season but were easily removed manually. Algal fouling on surface-grown bags was prevented using a weekly sun/shade rotation. Sediment-treatment bags remained free of fouling throughout the season without maintenance. Seed from the 2018 cohort in .22mm nursery bag- free of fouling organisms. During the course of the growing season I negotiated prices for littleneck clams with my current oyster distributors. Wholesale distributors initially offered prices ranging from 30 cents to 40 cents per piece for littleneck clams. All buyers said they would match the 40 cent price. This price range offers a 10 to 22 cent premium over clams that were wild-caught or cultured out-of-state/region. It is uncertain whether the top price would hold without the novelty of the product, though it seems reasonable that 30 cents could be achieved, even with greater availability. Though still too small for sale during the 2018 growing season, the clams from both surface and sediment treatments had excellent meat quality, with an exceedingly high sugar content. They were received very favorably by prospective buyers. The .22mm mesh used in the nursery in 2018 solved the problem of mechanical loss during the nursery phase. Bags remained intact and mesh was small enough to prevent seed clams from sifting out of bags. Unfortunately, the mesh was small enough to reduce flow and food to the clams and were likely the reason for much slower nursery growth in 2018 compared to 2017. A larger mesh- ideally 0.5mm and rigid (or less desirably soft and stretched over a frame) could split the difference between faster growth-rates and higher seed-retention. Alternatively, larger seed could circumvent this problem. Seed that retains on 2mm diamond mesh oyster seed bags could be implemented in traditional floating oyster gear for a nursery period. Seed large enough to be retained in 4mm square mesh oyster bags could be immediately deployed in sediments, skipping the nursery phase altogether. 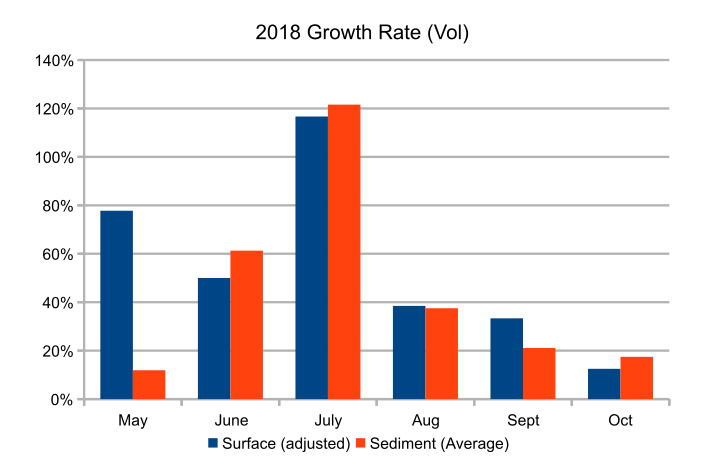 Though growth-rates were comparable between treatments most of the year, clams at the surface grew at a much higher rate in May than those growing in sediments. At the end of the season clams that were grown at the surface were nearly 25% larger than those grown in sediments- largely due the growth disparity in May. Seasonality (particularly understanding the cycles in foods availability) seems like an important area of further study- as the growth rates seen in the clams in this experiment were not closely related to water temperature (as is reported in oysters). If the growth rates recorded in 2018 remain steady, clams should begin reaching market-size in the summer of 2019- two years after planting. Stocking density data suggests splitting bags at a volume of 4000ml of clams to achieve ideal growth rates. Though this volume is feasible for smaller calms, those nearing harvestable size would likely need to be grown in higher densities to the keep process economically viable. Mortality during growout could be decreased through reduced handling. Retrieval and cleaning for experimental measurements accounted for most of the handling in this project. Prevention of deep-burial in sediments could help reduce winter losses. Though clams did not reach market size in 2018, it appears that this technique of clam/oyster polyculture could provide a viable secondary crop and source of income for subtidal sea farmers. Implementation and seed costs are relatively low and very little labor is needed to maintain the clams. 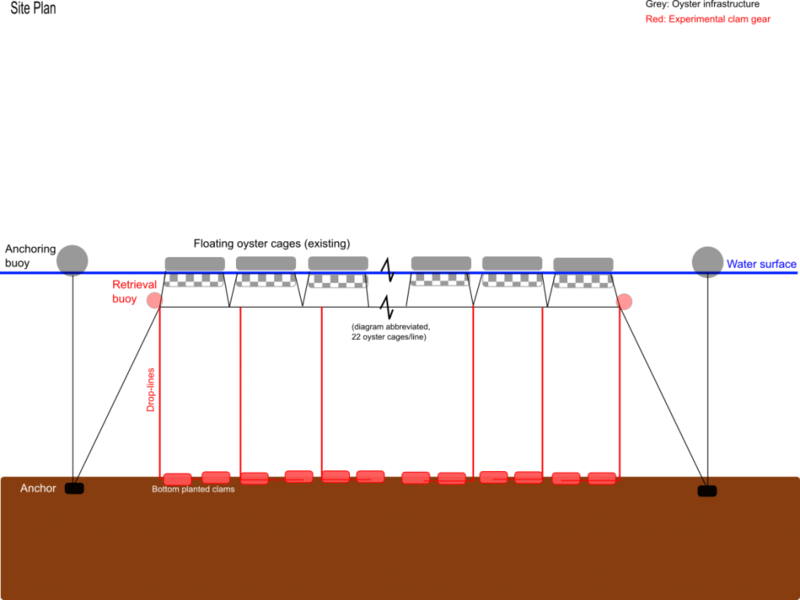 For this model to work, farmers would maintain a nursery on the surface, but clams would primarily be grown in the sediments (so lower value clams would not displace more valuable oysters). Spare surface space could be used for clams, especially during the spring when the largest difference in growth rates was observed. Below is a chart with projected costs and income. This model uses a final stocking density of 600 clams in each growout bag and assumes a seed survivorship of 50% and a market price of 30¢ per piece. It assumes gear replacement over a 3 year cycle (though this may be too conservative an estimate). Two projections are given- the first uses half of the available overwintering farm footprint (for ease of labor/handling), the second uses the full footprint (for maximum profit). Call/meeting with Manomet– Non profit with division devoted to aquaculture/fisheries research and outreach. Final report (upon approval) will be distributed through regional aquaculture mailing lists. The majority of reported farmers learned of the existence of this technique. 15 farmers have learned about the full process described in this project and at least 8 are planning on implementing it on their farms in 2019. I have worked on refining the technique and plan on full-implementation on my farm. I’ve added littleneck clams to my crop rotation and began buying larger numbers of seed for growout outside of research projects. Even before my first harvest, having littleneck clams on my farm strengthened relationships with buyers and generated excitement about my farm. With oyster prices falling with a glut of new farms, having a secondary crop feels somewhat like an insurance policy. The most difficult part of this work was handling small seed and maintaining it through the nursery phase. Though I eliminated vast majority of seed loss experienced in 2017, my new methods retarded growth. I think new nursery equipment and methods would greatly enhance the viability of this technique, and are an area where further research is warranted. The absence of a satisfactory nursery techniques (that adequately balance growth-rates and seed retention) prevented me from advocating for a standard methodology through a “how-to” pamphlet as was originally planned. Overall, I think the approach to this project was sound, though increasing the scale in a number of ways (size, location, and time) would better test this technique. I think that given the scope of this project, my work was successful. The process works and I plan on implementing this technique on my farm and hope to help other farmers adopt the practice. I am already sharing this technique and data with other farmers and a non-profit (with a focus on fisheries and outreach/education). I think spreading this research to a larger audience of this make-up would do the most good.